Etsy, sometimes described as the world’s largest craft fair, is actually an extraordinary marketplace dedicated to artists creating unique and one of kind pieces. While the products now range in the millions, finding sellers who provide specific custom goods and attempting to customize goods as a buyer can be incredibly challenging. As part of a feature integration challenge, my team was tasked with answering this unique dilemma. What did we think the problem was? Custom pieces are challenging to identify and communication surrounding custom pieces is time-consuming for sellers. How could we create features that easily identify sellers who take requests for customizations and also allow those same sellers to easily take requests. 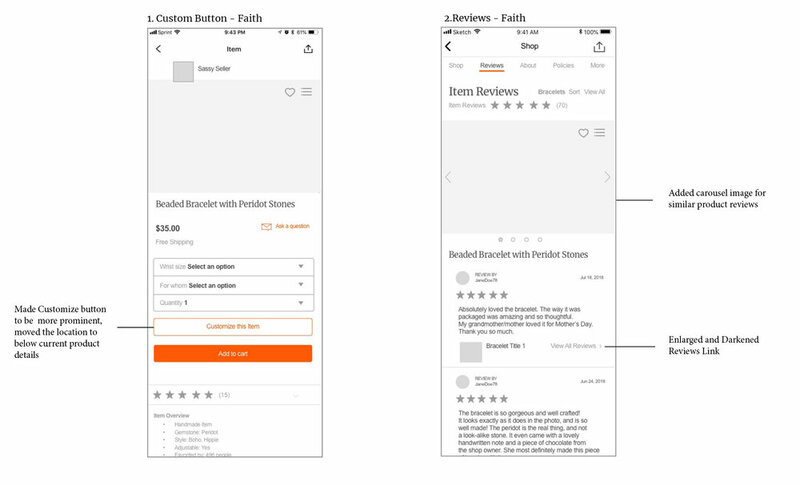 For starters, our team spent some time exploring the Etsy app to get a better understanding of their current search model and how customer and seller interactions were handled. My team set out to test our hypothesis through a series of screener surveys sent out over social media and email. We were aiming to talk to people who bought or sold custom items on Etsy. The screener produced a number of great results in identifying buyers but the seller side was harder to come by. For those, we reached out to our circle of friends to put us in touch with qualified leads and actual designers. Our goal was hear what the major pain points were both in searching for products and finding a qualified seller as well as what the process was like for sellers and how they engaged with customers. Through the interviews, I asked a series of questions and then was guided by each unique users experience as to what their positive and negative experiences were with customization, how often they used Etsy, and what they found surprising. We did a series of 8 total interviews with 4 buyers and 4 sellers on Etsy over the phone and on google hangouts each lasting for an average of 35 minutes. After our interviews and research, it was now time to make sense of this immense amount of data. Through affinity mapping, a number of keys insights emerged from both the buyers and sellers. Buyers are looking for sellers they can trust. They loved being able to find unique pieces but researching for these items and finding a seller that matched their needs was incredibly time-consuming. Reviews also played a significant part of their research and discovery process. Our main seller insights came down to communication time and clear project constraints. Sellers love making unique pieces for clients but sometimes the back and forth can be challenging. And also it is easier when buyers have a very clear idea of capability and capacity and as a designer. After our research and synthesis it was time to address who exactly we would problem solving for. Our primary persona from a problem standpoint was the seller. The problem areas, however, would be addressed and answered through the user side. Meet Alice a 29 year-old designer and illustrator. She loves creating unique pieces for her clients and also works at an advertising agency in Portland. Because she is short on time, communication and clarifying expectations with her clients on Etsy is a main pain point. Our buyer Claudia is a 43 year-old busy mom who loves to create special experiences for her three kids. She works part time as an editor for a magazine. She values quality and will sacrifice time and resources to ensure she gets exactly what she wants. However, due to her schedule she would a move efficient and effective way to find what she needs when it comes to gifts for special occasions. We really wanted to get an in-depth look at the customization experience and created a user journey map for Alice to really direct where the main pain points were in the process and how to streamline the process for both the buyer and the seller. Feature focus for the app was determined by prioritizing what MUST be offered, what SHOULD be offered, what COULD be offered, and what WON’T be offered in this iteration. Once we knew exactly who we were designing for and what their needs were it was now time to decipher what to make. My team began this process with a design studio sprint, generating a number of ideas quickly and then refining and iterating on common themes. Each member went off for 10 minutes and worked on a series of sketches for implementing the desired features. We we then came together to discuss and build on each other’s concepts for finalizing how the features should be best incorporated into the platform. Once we defined the core features to be added to Etsy, it was time to build and test our concepts. Our team divided out the initial mid-fi wireframes to ensure each team member had a crucial hand in what the user experienced. It was now time to start user testing. We did 2 rounds of user testing with 4 participants in each round. We were seeking to examine the learnability, efficiency, memorability, error-management, and satisfaction of the Etsy app. Our first round of user testing gave us some clear insights as to what could be improved. The initial ease of use on the app was rated at only 3.5 and we had errors on 2 of our main tasks. Users were confused as to what the custom feature actually did and also had a hard time discerning user reviews for similar products. For Round 2 we aimed to address these issues through our redesign. We did receive some feedback which was incorporated into our final hi-fi design. These changes included, increasing the visibility of the filter, further adjusting the similar review callouts for enhanced visibility, and changing custom to customizable on the product search page. Each of these changes, ultimately produced a useful and integrated feature that could enhance sales for sellers of custom products and decrease the research time for buyers. You can review the hi-fi prototype here or see below for our screen grabs. 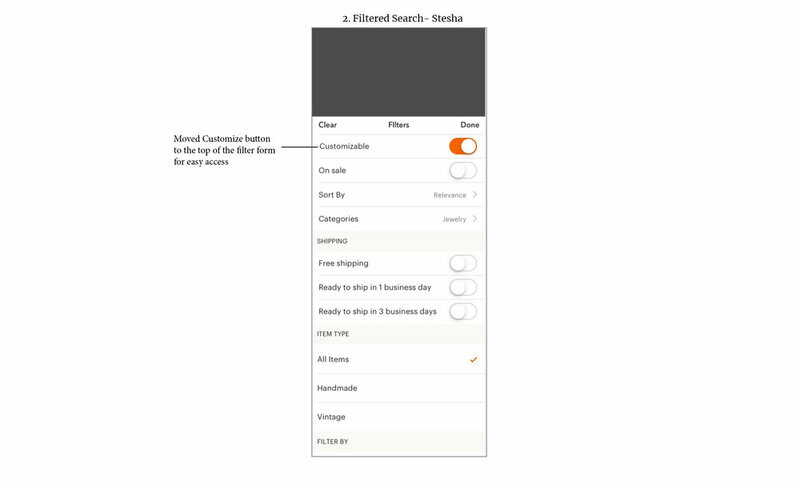 Video highlighting customized feature integration into search and product page.